Gloria Guinness (1912-80) was a wealthy, elegant socialite and writer. She was voted 'Best Dressed Woman' in the world by Time magazine in 1962, second only to Jacqueline Kennedy. Gloria Guinness had a full wardrobe in each of her seven homes, so that she would never have to pack. She saw haute couture as an art form and patronised many couture houses. 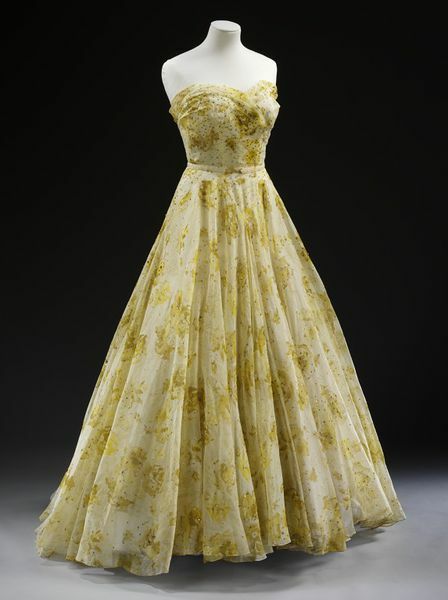 She gave dozens of items to the V&A, including pieces by Cristóbal Balenciaga (1895-1972), Chrisitan Dior (1905-57), and Hubert de Givenchy (b.1927). Amongst these famous names were several lesser known labels, such as Jeanne Lafaurie (house dates 1928-58). This is the only dress by Lafaurie in the V&A's collection. Evening dress of yellow printed organdie. It is strapless, with a full skirt and train. Patterned with a darker yellow floral print and re-embroidered with sequins and brilliants. Self-fabric covered belt. Designed by Jeanne Lafaurie (house dates 1928-58). Michael Goma (later of Patou) was creative director from 1950 to 1958, after which time he bought the house and named it after himself. André Courrèges (b.1923) trained at the house of Lafaurie. Gloria Rubio y Alatorre, better known as Gloria Guinness (1912-1980) was an elegant socialite and writer of the mid 20th century. Her third husband, whom she married in 1951, was Group Capt. Thomas Loel Guinness, a Member of Parliament (died 1989) and an heir to the Guinness beer fortune. 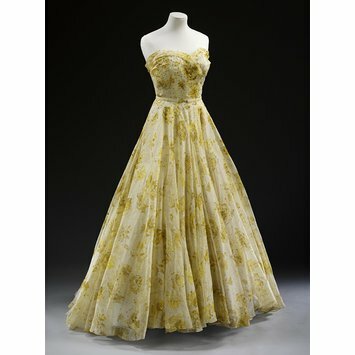 Other dresses donated by her to the V&A show that she favoured yellow for her evening dresses - a colour which would have flattered her complexion. Evening dress and pair of belts of printed organdie, possibly designed by Michel Goma for Jeanne Lafaurie, Paris, early 1950s. Many smaller couture houses closed in the early 1950s as the number of couture clients decreased and the industry became increasingly dependent on export sales. This organdie dress by Jeanne Lafaurie is the only example of the designer's work in the V&A's collection.